Offered in brilliant uncirculated condition, the 2015 1 Kilogram Silver Australian Kookaburra Coins are the newest and largest in the series. The Perth Mint first introduced these coins in 1990, making the 2015 coins the 25th edition to the series. Each of these coins contain a total weight of 1 kilogram (~32.15 troy ounces) of 99.9% pure silver. 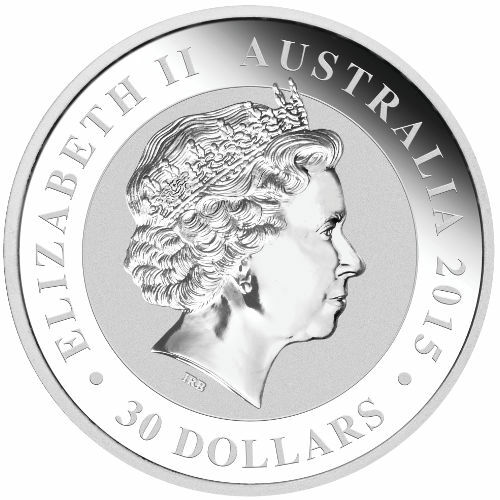 For the 2015 Kilo Silver Kookaburra coin’s obverse design, the Perth Mint has used Ian Rank-Broadley’s portrait of a young Queen Elizabeth II. In Rank-Broadley’s image, the queen is shown wearing one of her famous tiaras with her hair and facial features etched in great detail. Inscriptions for the queen’s name and the country are etched along the outer edge of the coin with the year of minting and face value listed below. To celebrate 25 years of minting the Kookaburra series, the Perth Mint has applied the original design used on the 1990 series. This image features a single kookaburra bird as he sits on top of a tree stump and stares vigilantly off into the distance. The bird’s name “The Australian Kookaburra” is etched along the outer edge of the coin followed by the purity, weight and metal type “1 Kilo 999 Silver.” Underneath the image, the years “1990-2015” are inscribed to denote the 25th anniversary of the series. Marking an impressive benchmark in the Perth Mint’s Kookaburra series, this 2015 1 kilo fine silver coin will make an impressive addition to most any collection. 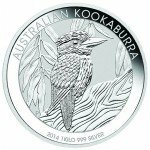 Whether you collect coins from the Perth Mint, are a wildlife enthusiast or are merely looking to invest in silver, the 2015 1 Kilo Silver Kookaburra coin is a fine choice. All coins purchased through Silver.com are dispatched from our facility securely with full insurance. To further protect each customers investment in precious metals, we require a signature confirmation upon delivery for orders exceeding $300. 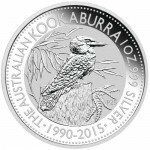 Should you have any questions about our products, including the 2015 1 Kilo Silver Australian Kookaburra coin, call us at 1-888-989-7223 and we would be glad to assist you.